There's just something about moms and cargobikes. ﻿﻿﻿- Isn’t the whole electric-assist thing just cheating? ﻿﻿- How much will a e-bike or an e-cargobike cost? - How many kids can I carry? - Gee, isn’t that dangerous? ﻿﻿- But wait, there are lots of cars out there! - Hey, I don’t have bike clothing! - What about riding on hot, humid days? ﻿- Can I ride in the winter? - But can I ride my kids on a cargobike in the winter? Isn’t the whole electric-assist thing just cheating? Here’s a common concern that some folks struggle with. The answer really depends on where you live, how you use it and what your needs are. However, the overall answer is an absolute NO! E-assist is a great thing for Vermonters who live in hilly areas. Actually, we’d venture to say it borders on a miracle!! This technology opens biking to families, seniors, and folks that want to replace a car for many of their trips. Think of it as a clean supplemental boost that just makes more biking way more possible and far more functional for lots more folks. Especially in Vermont, where we not only have hills but also a real lackluster bike infrastructure, e-assist is a great way to gain control of the road and go faster in places where you need to, like on roads with narrow shoulders. And since you can travel nearly at the speed of cars when you want to, you are far more visible to motorists because you are in their view for a longer period of time. On top of that, you will actually see fewer motorists passing you because you are going faster. Of course, much of the time you might not be using your assist or deploying it at a very low level just to keep you moving. And it's almost needless to say that a family cargo bike would be utterly useless in many parts of Vermont without the e-assist help. In addition, seniors, folks with special needs, and anyone who needs to extra boost will be replacing car trip. Would we really rather that kids and all these people lead lives confined to cars and SUVs? When is it actually cheating? Well, there’s always going to be folks that will take this up as a way to avoid pedaling – we do live in a culture where we have learned to be pretty lazy in that way. So, if you are thinking that this is just a free ride, OK, that’s flat out cheating and defeating the whole idea, to boot. Of course, when we drive an automobile we are cheating ourselves and our kids out of real sensory world experiences of the social and ecological environments we inhabit and honorably using of our bodies, but that's a whole other story we cover in other places on this site. Finally, if you think you don’t need an e-assist and can do your daily rounds without it, then by all means don’t go there. However, don’t give folks grief for wanting the boost in our hilly state. How much will a e-bike or an e-cargobike cost? E-bikes can cost anywhere between $1250 and upwards of $5000. You can always retrofit an existing bike of yours and spend as little as $400 on and e-assist add-on kit, but a good system will generally cost at least $600 to $1000 and you can always spend more. Most cargobikes run between $1200 to $3000 and more. Once you add in an e-assist option to a cargobike you might expect to spend at least $2000. That figure will likely be more because most folks end up accessorizing their ride to be able to carry the kids and haul cargo. Then there is the ELF, which has a base cost of $8500. It will all be money worth spending in the end! VBike can help to direct you over to getting a loan that will fit your budget. Any questions? Contact us. 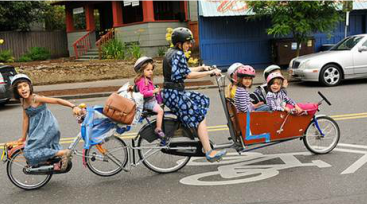 Emily Finch of Portland, OR has become a celebrity or sorts with what she does with 6 kids on a Long John style cargobike. This really depends on the type of bike you choose and the terrain you have to navigate. 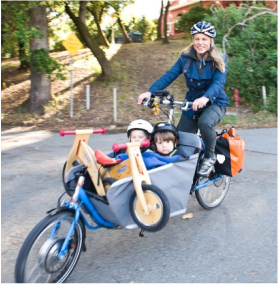 Most longtail cargobikes are great for carrying two children (and even a child and adult) or three smaller children. The Madsen seems to be best at fitting 3 to 4 kids comfortably with its real nice bucket with seat belts and optional weather covering. Some bakfiets and Long John style bikes can comfortably transport upwards of 5 kids. The other big issue is the type of electric assist system you choose and what your needs are as far as terrain and hills. Big hills with 3 kids on board a cargobike is going to require a high-powered assist. If you have only one child and your rides are more mild, you might choose something with less power. There's lots of information on our website about cargobikes and e-assist. If you are at all confused, please don’t hesitate to contact us. Do I need any special bike riding skills? If you already ride a bike then you are most of the way there. Depending on the e-assist system you get on your bike, you will also need to learn some basics about operating about your particular motor and how to best use it. Other than that, riding an e-bike or e-assist cargobike is basically the same thing as riding any bike, but with some important and added vital super powers we really need in Vermont. That said, for parents wanting to drive less and get their precious children out into the world on e-cargobike, it’s always best to start with simple rides to get used to your bike and know your comfort level. Of course, riding with the extra weight takes some practice, so take your time. There are some situations where it is best to own the road – tight shoulders, obstacles, going fast on the downhill. Don’t forget that you pay taxes and you own the asphalt as much as anyone else, so take the road when you really need to. Be sure to give the driver behind plenty of notice with a hand signal. We’ll be planning ride skill share events to increase the level of riding skills in Vermont. Contact us with any questions. This is one of the most common concerns to which there are several answers. First off, on the topic of e-cargobikes and carrying children, in general, there is far more control over the road on any type of e-bike. Give the fact that you can travel nearly at the speed of cars when you want to, you are far more visible to motorists because you are in their line of sight for a longer period of time. On top of that, you will actually see fewer motorists passing you because you are going faster. Of course, much of the time you might not be using your assist or deploying it at a very low level just to keep you moving. But it’s real important to remember that your e-assist is a great equalizer on road, especially in places where you might feel there is not enough room for you or where you actually need to take the road. The other answer is that safety is always a concern out there and it’s important to have mirrors, a flag, and ride with care. With the right precautions and common sense, riding with your kids or going it alone on your commute can be totally safe and an incredibly rewarding experience for you and your community. But wait, there are lots of cars out there! Many parents cite this fact. In reality they might perhaps be at the tip of a radically profound insight. Every time we drive a car we are unknowing collaborators in creating communities that are indeed unsafe for human beings to move about in a peaceful, connected, and ecologically responsible manner. And by marginalizing of other more appropriate transportation options, we help manifest an ecology of fear. This may sound like a harsh judgment, but it isn’t completely our fault. The inherent architecture of the automobile not only limits our connection to the world outside of its confines (that’s what give us that crazy car protection and comfort), but it also restricts our sensory awareness of the impact we have on the ecological and social worlds we pass through. There is a tangible loss of empathy within the automobile that most of us notice one time or another. It just has to do with the way the car is designed, its power it has in the world, and how it cancels out a significant portion of the bandwidth of our human sensibilities. So, our experience in the car is sort of like a really sophisticated video game. It has great visuals that convince a part of us to feel and believe we are experiencing something real, but in reality we are largely cut off from the real world and inside a completely controlled environment. And the more we drive, the more we will perceive the world outside of the car as fearful and dangerous – a world not to be inhabited by us. You wouldn’t want to all of a sudden materialize directly into the middle of one of those violent video games. right? It’s just safer to stay on the other side and clutch the controls. It’s so difficult to comprehend this because when we get into a car we are a dramatically changed being. As much as we get into it, it gets into us and our worldview. That’s the thing that we should be really concerned about. This whole bike thing is about getting back into the real world as much as possible. If we can shed the large exoskeleton whenever practicable we'll be showing up in our communities in the way we really need to at this juncture in history. Nobody is going to build us the infrastructure we want unless we decide that we are going to show up and lead the way. Check out the safety suggestions in the previous question and if you have other questions about safety, please don’t hesitate to ask us. We can do this! Hey, I don’t have bike clothing! The bike industry and the culture that has evolved around it has brought the American idea of biking to a rather high level absurdity. The ridiculous clothing trend is one of the worst parts of this. So here’s a great thing to know; you can ride wearing really anything you like as long as you find it comfortable and safe. For general commuting and errands almost anything will do that’s weather appropriate. Many Vermonters already have clothing for foul weather and winter conditions. This is not to say that you shouldn’t buy anything that’s made for cycling. You might want to look into specialized cycling wear for long distance riding and for inclement weather. What about riding on hot humid days? There’s no shame in using your e-assist a bit more on real hot days to keep the sweat factor down. This is another place where the e-assist technology really shines. In addition, you may have chosen to be a transportation biker, but you never signed up to voluntarily be the air filter for every car and truck that passes us. The e-assist will help you on those days and situations where going all out physically might not be a good idea. Another great thing about the electric-assist option is that it helps to keep transport biking a more physically and psychologically sustainable behavior. The idea here is that the bike is arguably one of the best inventions of western civilization and a key to creating a sane transportation in our world. The e-assist just makes it way more viable for Vermonters to do it everyday. So, don’t let anyone in spandex convince you otherwise. Yes, it rains in Vermont! It also does it in Portland, OR (and then some), where more and more folks are riding every day. First off, it is helpful to have some decent weather gear. A good waterproof jacket, pants and shoes will keep you dry and fenders on your bike will keep much of the splash away. But you needn’t get too fancy with it if you don’t want. Actually, a ride with precipitation can be exhilarating and enlivening, but in truth that really has more to do with mindset than anything else. We were all brought up in the age of the automobile which has had a massive impact on how we view the world and ourselves. And in reality, the car is a sort of garment anyway that we wear around our bodies. The fact that we haven’t exactly noticed this is part of the normalization and misrecognition of the car. So, back to the main point, riding in the wet is a great way to be in the world, but make sure to bring and a new set of eyes (rainwear also helps). And a quality e-assist system will purr away in the rain, making the ride shorter, if needed, and far less sweaty if you are riding on a warm, damp day. As mentioned before, you’ll also have great control of the road, but take it a bit slower in tricky sections and watch for potholes that may be filled with water. For kids on a cargobike, it’s a matter of mindset and making it fun. Be sure that they have quality rain gear and some good songs to sing – “riders on the storm…” Of course, no kid would refuse to sit in the comfort of Long John bike or a Madsen cargobike that can be outfitted with a rainproof covering. The other choice would be a velomobile like the ELF in which everyone stays mostly dry. But hey, we are mostly made of water anyways, so let’s begin celebrating a good part of who we are! Finally, if a motorist ever makes an unflattering comment about your rain gear you might also inquire about their 2 ton garment. E-assist help you to get to where you are going a bit faster (especially up hills) so your range is greatly expanded. OK, you’re probably noticing a pattern here. There seems to be a “rah, rah, rah” about all these things that your mother might tell you are absolutely meshuganah (especially if she knows a little Yiddish). But, riding in the cold – yeah, you guessed it – can be a great source of joy and connection, but you need the right gear. Everybody experiences the cold differently and some folks are more sensitive than others. But what most people experience about the frigid months is that while the temperatures drops as winter wears on, we all seem to acclimate . In the late fall, the first 30 degree day might seem unduly painful, however by mid-winter that same temperature will feel somewhat tropical. The fact is that our body adapts and our comfort margin becomes considerably more resilient as the cold gets colder. Much of cold weather riding is about acclimation. Challenge yourself to ride in a temperature that would seem a bit difficult, but not unbearable. Notice what part of your body gets cold – probably your hands and feet. Try something different to see how that works and take a look at some of the suggestions below. The beginning of the cold season is the most difficult because we haven’t acclimated yet and just the thought of cold may send the shivers down your spine. The trick is not to get scared off. Now here’s a real important part – for cold weather riding, the e-assist is just about a revelation! Since it’s on the frigid days that you may want to travel a little faster to get to that warm, comfy place on the other side of town. That’s exactly what an e-assist can do for you. So this means we can extend our range, whether it’s a flat commute or up into the hills, by helping us to go a bit faster when we really need to. Can I ride in the winter? It’s really way more possible than you might ever think and maybe even way more fun than you could ever believe. Thousands of folks in Minneapolis, MN ride year-round in their profoundly cold and snowy winters. In fact, so many Minneapolisians are into it that the city was chosen to hold the 2016 International Winter Cycling Congress. It's time to get really "Vermont strong" and start doing that here. There are a number of things to consider for riding in the winter. But first off, most Vermonters already know how to get dressed to go skiing, snowshoeing, or snowmobiling, so winter biking is just another one of those winter things many of us are ready for. However, winter riding does require some new skills and some equipment that will make it a lot easier, more comfortable and safe. Most importantly, riding in the winter is about common sense. We’re not condoning going out in a full scale blizzard, but you probably shouldn’t be driving then also. There are many different opinions about winter riding, so we encourage you to look at other websites to get the full range. We think that the REI winter biking site is excellent, so take a look at that. You’ll find lots more if you do a quick web search. The one thing we’ll add in is that in Vermont you should ride with studded tires before the roads get icy. Studded tires come in a variety of sizes, widths, and stud counts. Probably the best source of information can be found on the website for Peter White Cycles in NH. Here you will find all the high quality tires with a very through explanation about each one. Studded tires excel at keeping your and your bike upright in slippery conditions and one ice. Make sure any studded tire you purchase has tungsten carbide studs and not just straight up steel ones - those will wear out in one season. Something that you won’t find much discussion on in a web search is on the topic of e-bikes and winter. Like we mentioned in the post above about cold temperatures, an e-bike generally gets you to places faster and so that’s a big advantage in cold weather. The other thing is that if you have a front hub motor on your e-bike you essentially have an all-wheel drive bicycle. Outfitted with studded tires and the front e-assist, your bike will be capable of excellent traction. This works especially nice with longtail cargobikes. Watch for some of our reports in the R & D section of the VBike website as we begin to do more product test and experimentation. There will be lots more to tell about the advantages and disadvantages of different types of e-assist options, internal vs. external gear systems, belt drives, and a host of other topics. If there is a last word it’s that winter riding in Vermont is a thrill. Once you really get into it you might find that as the roads gradually clear towards the coming of spring you’ll actually begin to miss the snow and ice. It’s kind of strange, but true many folks who ride for transportation in the winter. But can you ride your kids on a cargobike in the winter? The answer is yes! As mentioned in the question about winter riding, a longtail cargobike outfitted with a high quality front hub motor is nicely suited for winter bike transportation. Essentially, you have an all-wheel drive vehicle – you power the rear and the front is powered by the hub motor – that is highly stable and has great traction. This works specially well if you change over to some nice fat studded tires for the winter. That said, since your kids are the most precious cargo you ever haul around, make sure that your skills are up to the challenge. If you are just beginning, take baby steps and get in some good practice without the kid passengers. Winter is not the time to just begin starting your family cargobike lifestyle. Get started in the spring and ride through the summer and fall. If you feel you are ready, go ahead and check in with other experienced winter riders or get in touch with us. Finally, you should know your roads real well and take a look at the other suggestion we have about safety in this FAQs page. The section above on winter riding is all applicable to this subject of winter cargobiking. And make sure to check out all the information on the internet about winter riding and winter bike maintenance issues and skills. Not only is this possible and doable (of course, depending on where you live), but it is also incredibly enlivening for you and your children. We’d love to hear about your experience!